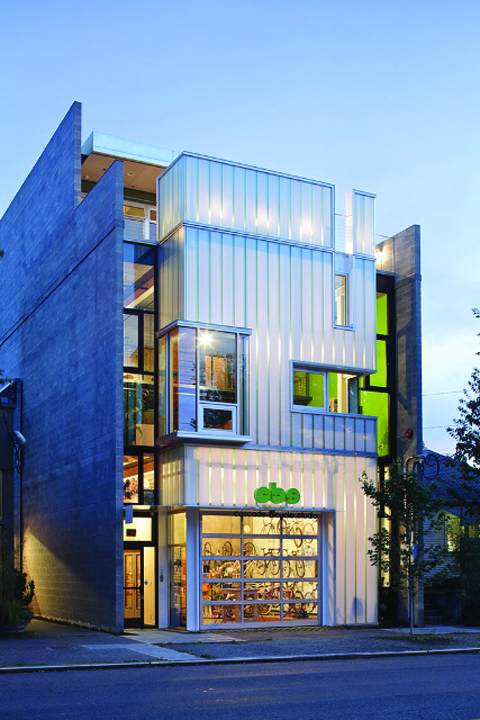 Located in Seattle's Freemont District, Building 115 is a multi-faceted structure combining a home, an office, a workspace and a retail environment into one artistic yet functional mixed-use building. Building 115 was developed by builder/owner Dave Boone of dBoone Construction and designed by Graham Baba Architects. One of the challenges with Building 115 was balancing structurally stable, aesthetically pleasing material that would still allow for a maximum amount of daylight. The building could also act as a lantern during the night, providing an inner glow effect while maintaining a high level of privacy. The solution was to install Technical Glass Products' (Snoqualmie, Washington, USA) Pilkington ProfiliT™ channel glass system, insulated with LUMIRA® aerogel-filled, multi-wall polycarbonate panels. Approximately 550 square feet of Opal LUMIRA aerogel was incorporated between the channels to diffuse natural light, provide thermal insulation, and reduce noise from the adjacent busy street. The cast-glass channels are available in a variety of colors and textures with varying translucency, which allows for the passage of natural light without loss of privacy. The channels, available up to 23 feet long, can be installed vertically or horizontally and can be configured as straight, curved or serpentine walls. In Building 115, the architects incorporated LUMIRA aerogel in the enclosed space between the channels to enhance further the energy performance and reduce sound transmission. "We wanted to create a building that would visually interact with the street activity. But in order for the space to be livable, we needed to balance transparency with privacy," says Jim Graham, principal, Graham Baba Architects. "We needed a material that would let in light, allow for privacy and be visually interesting day or night." According to Ron Madeley, TGP Project Manager, "Building 115 was unusual as it consisted of some challenging intersections and materials integration into and behind the channel glass wall that had never all come together in a single project before. With glass corners, integral vision lights, and stepped transitions spanning floors in the building, the layout had to be perfect."